Sometimes you just need something crispy! 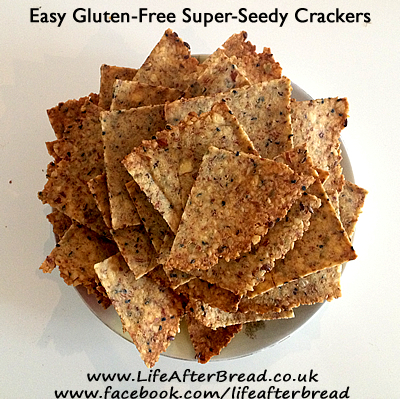 These savoury crackers are a great alternative to packaged tortilla chips or crackers, packed with Omega3-rich nuts and seeds instead of inflammatory corn and additives. Dip them into salsa or top them with guacamole… or just snaffle them plain! If you have a food processor, whizz all the dry ingredients until fine then add the butter and egg and mix again until you have a firm ball of mixture.If (like me, boo!) you don’t have a fancy processor, you can chop the nuts and seeds by hand to reduce their size and then grind them smaller with a pestle and mortar (you can wear a headscarf, sing folk songs and pretend you’re an original homesteader for this stage if it helps). Then add the butter and rub in like you do to make pastry. Then add the whisked egg and mix with a fork. When you have your ball of mixture, break it into two pieces. Cut a piece of baking parchment paper to fit your baking tray and lay it out on a flat surface. Place one ball of mixture on the paper and flatten a little with the palm of your hand. Place another piece of parchment paper on top of the mixture and roll out until it is 1/4inch thick and roughly the shape of your tray. Remove the top paper and use a large, sharp knife to make cut impressions into the rolled out mixture (don’t try to sweep the knife through as it will only drag as much as it cuts) . Place in the middle of the oven and bake for 6-8 minutes. Check after 6 or so, and remove any of the outer crackers that are browned enough. Pop the tray back in for a few minutes to brown the remaining crackers. Cool on a rack and try not to eat them all at once!